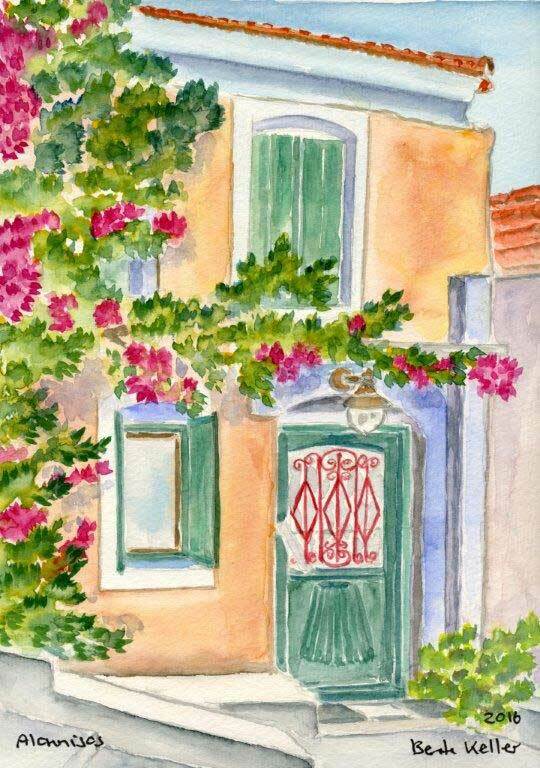 Learn to paint watercolours on the beautiful island of Alonnisos. The strong light and the vibrant colours in the landscape and sea are very inspiring. The island is rich in vegetation and the green, hilly slopes are interrupted by astonishing, steep cliffs in varied colours schemes - all a big challenge to paint. 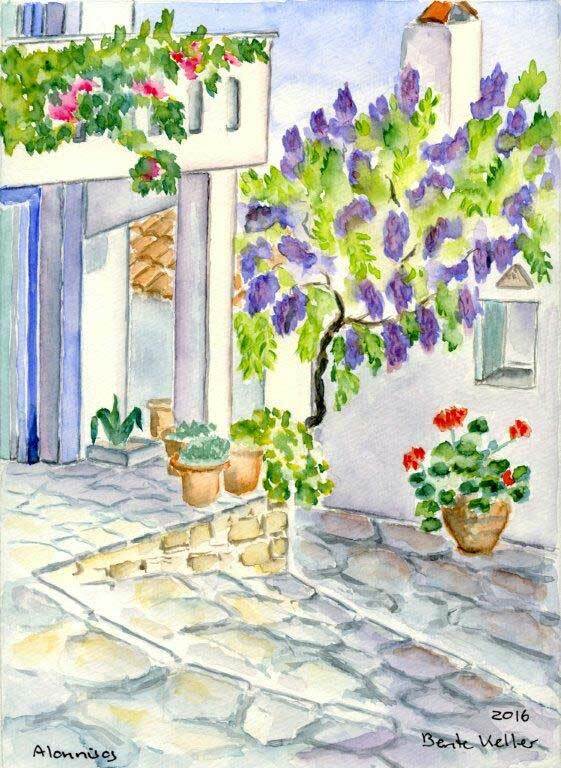 Further inspiration is to be had in the old village, Palia Alonnisos. Situated high up on two hills the view is impressive and the narrow, steep lanes, traditional village houses, pots with flowers, old Byzantine churches and small squares are all waiting to be drawn and painted. The course is held here in this charming village. Every morning starts with a general class which includes many exercises. Then we continue with individual supervision in your own watercolour painting. The daily course finishes with an evaluation of the work of the day. 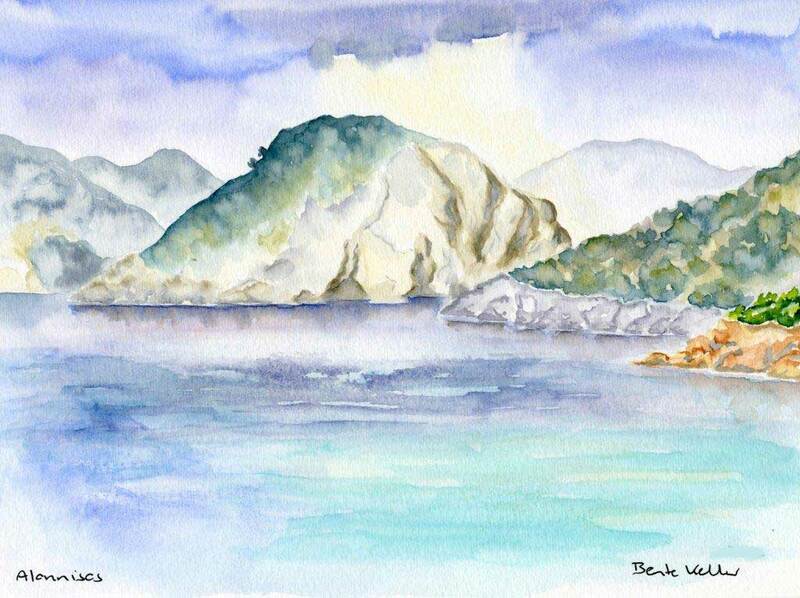 These exercises are the fundamentals of the watercolours you subsequently paint on your own. For more info you can open the below link and read the full program, how to reach Alonissos, where to stay, terms and conditions and a little about me. You will receive an e-mail where I confirm your booking and with my bank details so you can pay the deposit. You can also pay with PayPal. When you have paid 80€ in deposit you will receive a welcome letter. The rest of the amount has to be paid 40 days before the start of the course. choose a hotel in Votsi (or Patitiri) to be close to where the seminar is held. If you prefer to arrange the trip yourself you have to look for flights to the island of Skiathos. 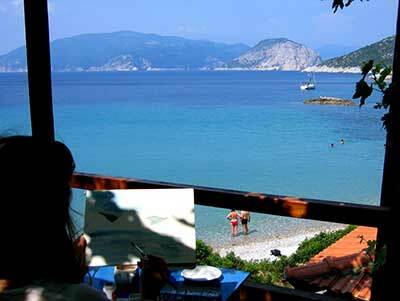 From Skiathos it takes 1�-3 hours to Alonissos with a hydrofoil or ferry. If you prefer to fly to Thessaloniki, Athen or Volos it takes between 3 to 6 hours to reach Alonnisos. Via Skiathos, Volos and Thessaloniki: Ferry boats or Flying Dolphin or CAT, which are hydrofoils to Alonnisos. See Hellenic Seaways: www.hsw.gr for reservation, time schedule and prices. Via Athens: Flights to Athens and then a bus from the center of Athens, Kanigkos Square, to Agios Konstantinos and from there ferry boat or Flying CAT hydrofoil to Alonnisos. The bus service connects with the Flying CAT and both bus and hydrofoil tickets can be purchased at the same time from the office in Kanigkos Square. See Hellenic Seaways www.hsw.gr for reservation, time schedule and prices.